found on a end of year clearance sale. I gave it a home, tucked up next to Rabbit Run Cottage. Thank you–and thank you for visiting! Oh I would love a deep maroon-pink!, but I do love this white one with streaks of green. I have a purple one, but it is struggling. 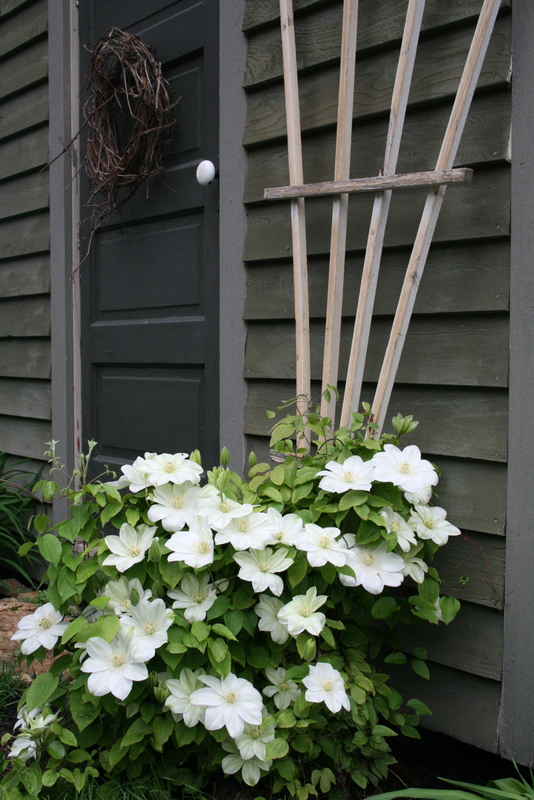 Those surprises are nice: I did the same with a clematis that I discovered last week was maroon! I love to buy those “cheap” pots and see what happens! That looks like a Henrii clematis. I have one too. It grows but in a shady spot, so it’s not near as prolific as yours. Wonderful! Oh thanks Paula–I have not taken time to figure it out yet! It sure gets attention from people when they visit out here.